The pen is mightier than the sword and all that jazz. Words are the key to victory. Assessment and mutual understanding lead to connection. Dialogue leads to treaties. Oversimplified, but you get the idea. In the grand scheme of language, the term “Latinx” is brand new. It is a new iteration of a long and storied history of a group of Americans taking control of the labels placed upon them. “Latino,” “Brown,” and “Latin@” were all evolutions that occurred both within and outside these communities. And each evolution has been hotly debated at every turn. “Latinx” came into existence in recent years and has specifically gained traction as a powerful act of resistance against gender hierarchies and binary categorization for Latinos and Latinas. There are many places to learn about the origins of the term as well as the positive and the negative responses to it. As a national nonprofit aimed at lifting up education leaders of color in service to the underserved children of the United States, we at the Surge Institute strive for progression and forward-thinking in all our work. It’s what our mission is all about. This forces us to be cognizant and thoughtful about the many social justice movements arising in this country alongside our own, particularly as we expand our work to progressive spaces like the Bay Area. We must make ourselves part of every conversation that presents new and more inclusive ways to talk about the communities we seek to serve. 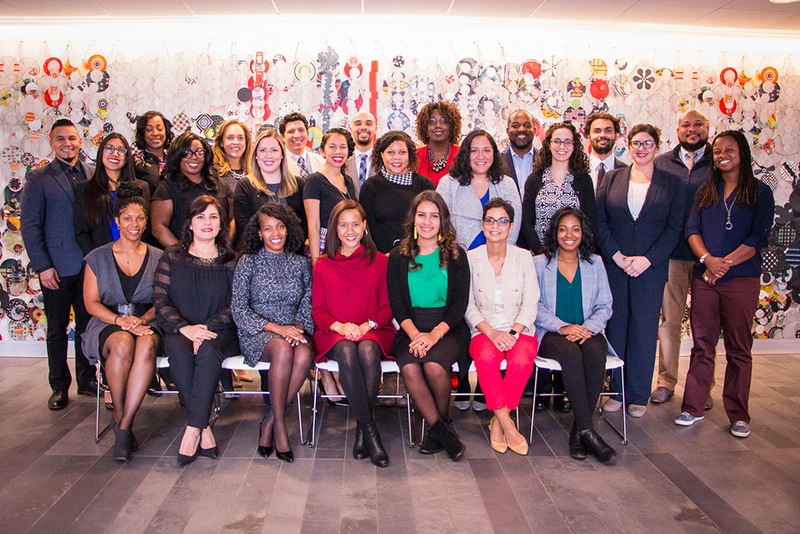 The 2018 Chicago Surge Fellowship is made up of 24 emerging African-American and Latinx education leaders. When the question of using the term “Latinx” came up, we gathered as an organization. Our entire team—in Chicago and Oakland offices— came together for a deep discussion on whether to officially adopt the term into our language. And that discussion did not end until every voice was heard. Some team members were enthusiastic about “Latinx,” praising its progressive acknowledgment of the gender spectrum. Others were concerned about its potential trendiness and disregard of years of the ethnic complexity and diversity of identity of the Latino community. Latino and Latina members of our leadership team fell on different sides of the argument, presenting thoughtful and valid arguments for why they did or did not identify with this relatively new term. We also sought the guidance and opinions of Latino and Latina Surge Alumni, who were honest about their love, hate, and indifference for the term. The process was thorough, but never thorough enough, and it was both enlightening and taxing. There was no consensus—nor could there ever be—but we needed to make a decision. So we leaned into inclusiveness. Ultimately, no individual is forced to identify themselves using a specific term. We are who we choose to be. Not all black people like the term “African-American.” Not all African-Americans like the term “Black.” We understand what is meant by the terms and that’s enough for a dialogue to begin. Each individual is free to self-identify. But as organizations, companies, institutions, we must be well-intentioned in how we use language. In disregarding the term “Latinx,” which seeks to include, we disregard a growing population of people with gender non-conforming identities, who are already made to feel like outsiders. As people of color, don’t we feel that way enough? We are framed as the “other” plenty. Let’s not do it to each other. Our intention is to be inclusive and see the beautiful spectrum of leaders across race, ethnicity, and sexual orientation. We want to create spaces of love, healing, and transformation. We need leaders to show up in all their power, genius, and courage so they can transform education spaces for the communities and children they serve. That is our mission, and our language should reflect that. By adopting this term into our language, Surge is saying we want Latinos, Latinas, and all in between and beyond those parameters to shape the future of education for our youth. All. Language is messy. So are labels. But vocal clarity in inclusion is just as important as inclusion itself. We have communicated an effort at unity, and hopefully, that message is clear. We welcome emerging Latinx leaders to this movement. https://www.surgeinstitute.org/wp-content/uploads/2015/04/logo.png 0 0 Chris Paicely https://www.surgeinstitute.org/wp-content/uploads/2015/04/logo.png Chris Paicely2018-03-13 10:20:352018-03-19 08:16:08Why Surge says "Latinx"